Congressman John Lewis has made a life out of getting into “good trouble.” The civil rights icon who marched alongside Martin Luther King Jr. in Selma, Ala., and was the youngest speaker at the 1963 March on Washington implored a crowd in Atlanta on Saturday to keep fighting for equal rights. “Look, you know, I’ve been talking for some time and getting in trouble. 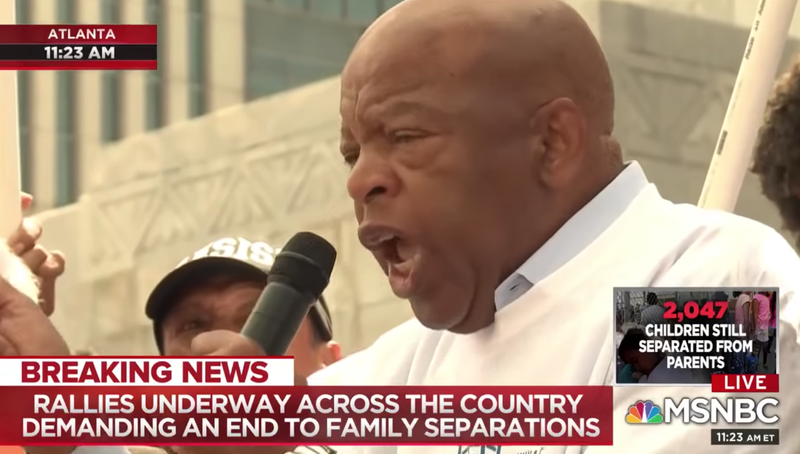 It’s time for some of us to get in good trouble, necessary trouble,” Rep. Lewis (D-Ga.) told the crowd at the Families Belong Together rally. “In the final analysis, we may have to turn America upside down to set it right side up, but whatever we do, do it in an orderly, peaceful and nonviolent fashion,” he said. The nationwide “Families Belong Together” protests came in response to Donald Trump’s draconian immigration policies and racist rhetoric towards Latinx migrants. While the Trump administration recently reversed its own policy of ripping migrant children from their families at the U.S.-Mexico border and keeping them in separate, children-only detention centers, it has ramped up anti-immigrant propaganda. Saturday, in response to calls to abolish Immigrations and Customs Enforcement (ICE), Trump claimed the 15-year-old enforcement agency “liberate[d] towns from the grasp of MS-13"—a Salvadorean-American gang. Trump has name-dropped the gang constantly in recent weeks in an effort to raise fear about Latinx immigrants, exaggerating the gangs’ presence in the U.S. and falsely associating incoming migrants with MS-13. Lewis told the crowd Saturday, “there is no such thing as an illegal human being.” As USA Today reports, Lewis wrote a letter earlier this month condemning Trump’s immigration policy as a “shame, a disgrace and an outrage,” adding that Atlanta is among the worst places in the U.S. for an undocumented immigrant.